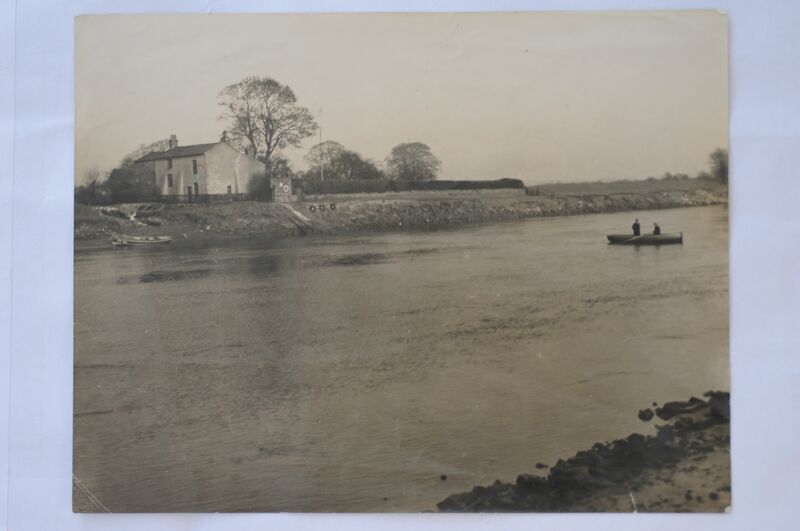 Saltney Ferry began in 1790 and was operated by generations of the Manifold family, until the footbridge replaced it in the 1960s. You can see part of the ferry house near the bridge. 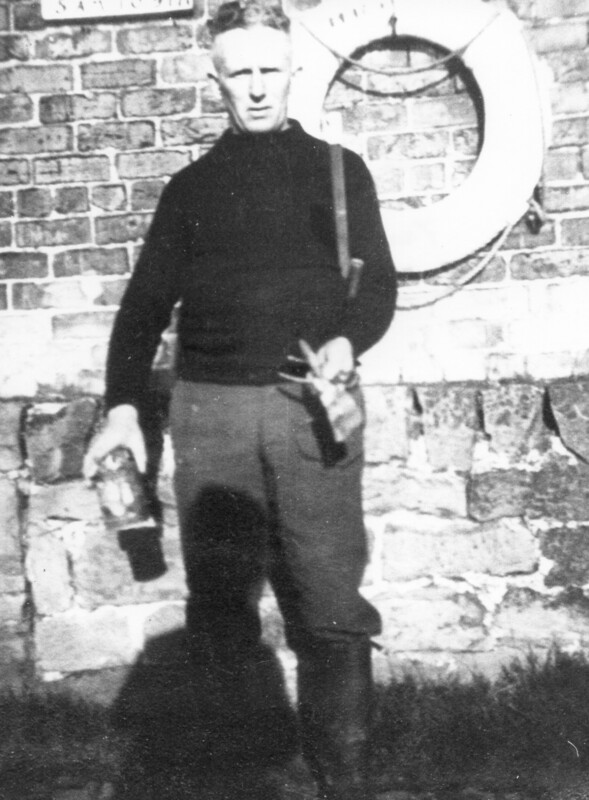 Bob Manifold was the last ferryman. Listen to some of his memories from the archive recordings held by Flintshire Library Service. Ferry photos thanks to the Manifold family. 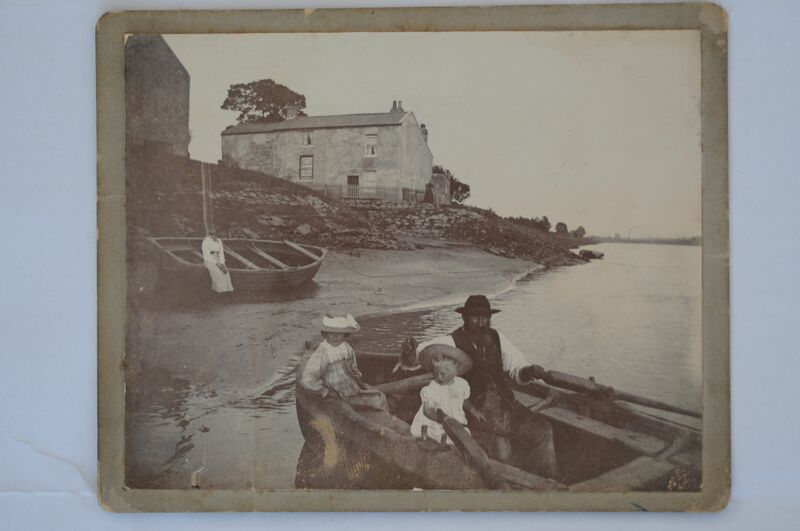 Our family was a fishing family from Whitby on the Mersey and one of them came over and took over he started off in 1790.Theyve been here ever since I was the last of them. It was a free ferry by law, Higher ferry, and Queensferry was the lower ferry. The first one who came here was a boat builder too and he did all sorts of jobs but he mainly just kept the ferry in repair you know. We had a lot of trouble with ice sometimes you know. Once it knocked us off for a month and we couldn’t do nowt. I remember ’39 it was frozen up solid and the tide- a big bore it suddenly bumpf busted it. There was a devil of a row there were big lumps of ice ten foot long along the wash you know. We used to have some fun. Aye. There was an old lady come here one day who wanted to go across and she said” I’m not going to the steps over there you know I want to go up there”. So I went traipsing up that side it was all mud you know. So I went ashore and she got out through this muck and she said “now don’t forget you wait for me now or else you’ve had it. ”So I hopped it back again. Fellow used to come every morning fell asleep leaning on his bike, and one day when we got near the steps his damn bike dropped in the river. So he went to work.And a fellow used to cross and he comes down the steps, and I had a boat hook scraping around, and he said “What are you looking for? 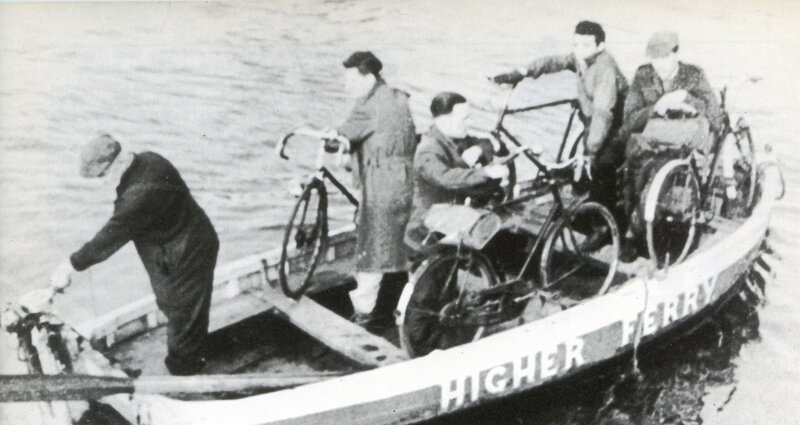 ”and I said “There’s a bike here somewhere”, so I got the bike in the end and put it in the boat and I said “ now the fellow must be here somewhere” and he said “ruddy hell” but he wasn’t of course you know he’d gone to work! Me dad and me was going down, and two of the lads to fish on a Sunday morning and as we got near the bridge he said “What’s this? A woman’s hat floating down the river!” when I looked I could see it wobbling and I thought there must be someone underneath. And there was. We grabbed over and grabbed her up the side on the stone and I knew what she was going to do, grab me, and she was 15 stone a big hefty women and she was shoving me in the river. Just at that moment there was a van coming down from Garden City and a policeman in his best suit. And I said come down here quickly and luckily he did and four blokes beside him, and we had a right struggle and she fainted. We got her on the bank and then another damned big woman came, she was her sister, and she bent over and gave her such a smack! And then she fainted. So he said “Five more men please”! And we was going round the back of the alley with these two big hefty women (laughs)! De Havilland started you see, but they got that many bikes that’s how the bridge come on the scene you know. They was a lot of bikes they thought there would be a right accident but there never was – no. 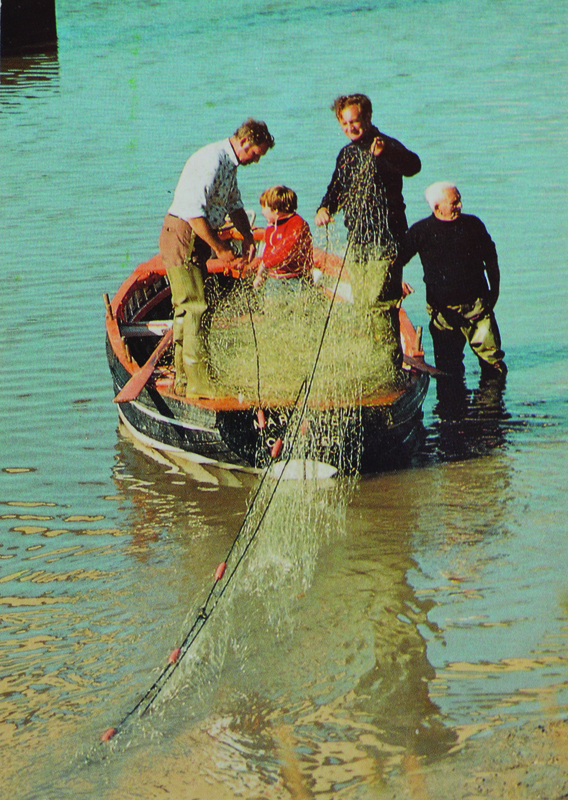 I was seventy the day the bridge opened, no it didn’t make any difference to me I just kept on fishing and that! (laughs).